Sarcomas account for only 1% of all malignant tumors, but they comprise more than 70 different subtypes. The growing knowledge on genomic alterations in soft tissue tumors allows for a molecular refinement of the morphology-based diagnostic subclassification and renders useful prognostic and/or predictive information for an increasing number of diseases. 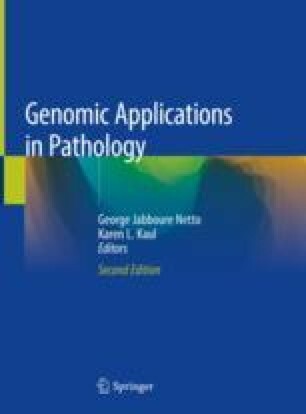 This chapter presents an overview of the genomic applications that play an increasingly important role in the diagnostic algorithms and treatment decisions in soft tissue sarcomas. It focuses on soft tissue tumors with intermediate and malignant biological potential which are characterized by specific genetic alterations while almost completely excluding the large group of benign soft tissue tumors and those for which characteristic alterations have not been found, including the majority of pleomorphic sarcomas. Huss S, Künstlinger H, Wardelmann E, Kleine M, Binot E, Merkelbach-Bruse S, Rüdiger T, Mittler J, Hartmann W, Büttner R, Schildhaus H. A subset of gastrointestinal stromal tumors previously regarded as wild-type tumors carries somatic activating mutations in KIT exon 8 (p.D419del). Mod Pathol. 2013; https://doi.org/10.1038/modpathol.2013.47. Joensuu H, Wardelmann E, Sihto H, Eriksson M, Sundby Hall K, Reichardt A, Hartmann JT, Pink D, Cameron S, Hohenberger P, Al-Batran SE, Schlemmer M, Bauer S, Nilsson B, Kallio R, Junnila J, Vehtari A, Reichardt P. Effect of KIT and PDGFRA mutations on survival in patients with gastrointestinal stromal tumors treated with adjuvant Imatinib: an exploratory analysis of a randomized clinical trial. JAMA Oncol. 2017; https://doi.org/10.1001/jamaoncol.2016.5751. [Epub ahead of print]. Mohajeri A, Tayebwa J, Collin A, Nilsson J, Magnusson L, von Steyern FV, Brosjo O, Domanski HA, Larsson O, Sciot R, et al. Comprehensive genetic analysis identifies a pathognomonic NAB2/STAT6 fusion gene, nonrandom secondary genomic imbalances, and a characteristic gene expression profile in solitary fibrous tumor. Genes Chromosomes Cancer. 2013; https://doi.org/10.1002/gcc.22083. Trautmann M, Menzel J, Bertling C, Cyra M, Isfort I, Steinestel K, Elges S, Grünewald I, Altvater B, Rossig C, Fröhling S, Hafner S, Simmet T, Åman P, Wardelmann E, Huss S, Hartmann W. FUS-DDIT3 fusion protein driven IGF-IR signaling is a therapeutic target in myxoid liposarcoma. Clin Cancer Res. 2017; https://doi.org/10.1158/1078-0432.CCR-17-0130.